handle the heaviest loads. 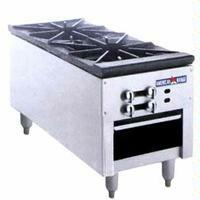 Heavy duty construction with stainless steel front and sides, they are both attractive and easy to clean. Heavy duty cast iron 3 ring burners rated at 90,000 BTU per hour, give instant high heat while the dual control valves for the inner and outer rings allow maximum flexibility to maintain desired heat settings. A full width drip tray catches spills and allows the lower cabinet to be used for additional storage. You will find that these rugged units will give many years of trouble free performance. Stainless steel front, and sides. Standing pilots for instant ignition. Dual control valves: One for inner and middle rings. Second for the outer ring. Die cast, chrome plated control knobs. Full width drip tray to catch spills.